As you all know, I love card games, be it traditional poker or collecting Pokémon or Magic the Gathering cards. 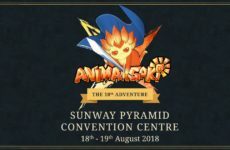 Thus, it is not surprising that I keep up with some of the latest news in regards to card games, especially new games that are announced or just launched this year. There were a few card games that were launched earlier this year including the reboot of Vanguard Card Fight and many more that were announced at various events. Today, we will go through some the card games either launched this year or will be launching soon that seems exciting and fun. Lets get on with it! First up is the ever playful and cartoonish Munchkin Collectible Card Game. Munchkin started out as a one-time purchase card game that can be played between friends to have a whacky fun (or make enemies). Since then, Munchkin has released dozens of expansions to further expand the quantity of cards and its own wackiness from Jurassic Snark to Munchkin Zombies. Now, Steve Jackson Games is releasing Munchkin in Collectible Card Game format where the play rules are different but retains the same goofiness of the original Munchkin. This is a card game you should look into if you want to play a casual, fun and whacky card game. Munchkin CCG is set to release sometime in August 2018. Architect Trading Card Game is produced by the same creator of the Force of Will card game, FORCE OF WILL Co. Ltd. Set in the future year of 2111, magic and science will clash where heroes from the past, be it historically or mythical pit against one another. Characters from Merlin to Leonard Da Vinci will fight each other to gain control and prove their own ideals. Some cards like Chaplain the Tramp and Joan of Arc were teased on their website but no word of the game play has been released as of yet. The premise of the card game seems promising but as with all games, the game-play has to be solid for it to be a good game. 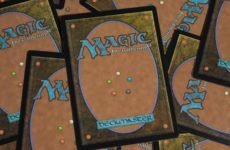 Although there was news of a Starter Duel Deck being released, so far there has been none. Therefore, we will wait and see how the game shapes up. Games Workshop who is well known for the Warhammer and Warhammer 40k miniature game franchise has worked together with PlayFusion to create a new card game based on the Warhammer universe. The game will have you deploy 5 heroes into the battlefield and fight out with actions cards, be it spells or items, until all the opponent’s heroes die. There are already demo videos out there that shows the game-play as the company attended the San Diego Comic Con to show off the game and give out demo decks to attendees. So if you are into the Warhammer universe and love card games, you can check this game out. 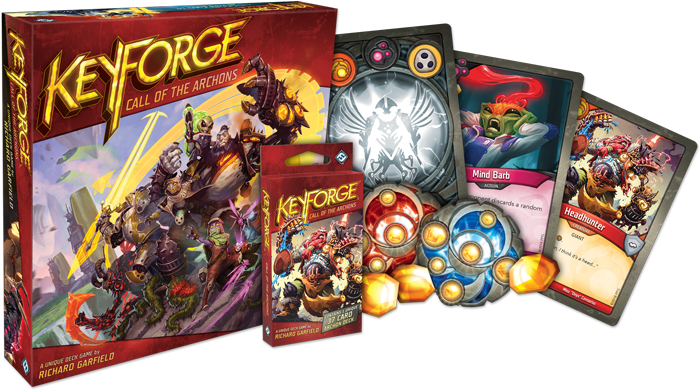 The man, the myth, the legend, the father of Trading Card Game, Richard Garfield, creator of Magic the Gathering is working with Fantasy Flight Games to create a new card game called Keyforge. The game promises that no two decks will be the same with its wide variety of cards. So far announced, the deck will comprise from 3 of 6 houses and each house having its own distinct theme. It looks like a very interesting game as there is no resource management in the game. A player can play any number of cards in his hand as long it’s from the same house announced at the start of the turn. Although I am a bit hesitant of the game since a lot of Fantasy Flight games were canceled and died, Richard Garfield games has always been both fun and creative. 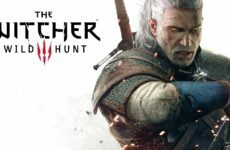 As of now, there is no announcement of a release date of the game. 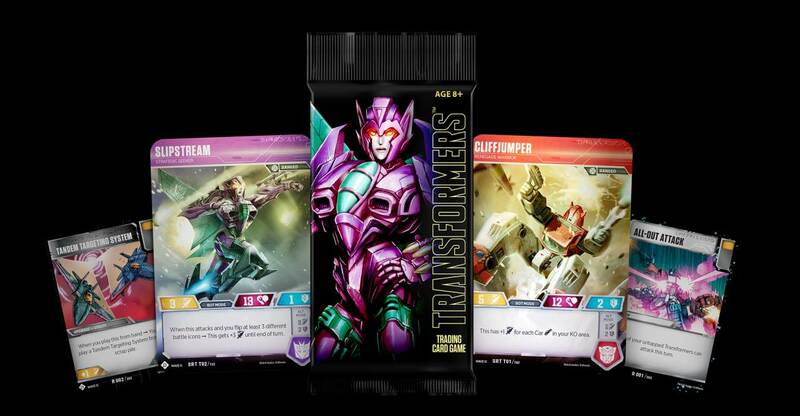 The most anticipated card game for me though is the Transformers Trading Card Game which will be published by Wizards of the Coast. Transformers has always been my favorite cartoon and toy line from my childhood. Thus, it’s not surprising that I am very excited for this game to hit the shelves and be able to try it out as soon as I can. So far, the game looks decent with transformingcCards having both art on both back and front for each Transformer and a unique battle game-play. Hopefully this will be my next card game hobby after I left Magic the Gathering a year ago. The card game scene has evolved tremendously over the years and even more now as digital card games are in the market. Traditional table top card games have to bring a much more vibrant appeal to the audience in order for the people to buy and play the game instead of sitting at home playing digital games. So far, the industry is pushing its limits with new game mechanics and fun game-play. Hopefully, some of the games do break out and prove to be both fun to collect and easy to collect. So what’s your most anticipated card game? Or is there any other card game you know out there that is coming out? Let me know. Until next time, keep slinging spells. Next PostDoes Black-Facing/White-Facing In Cosplay Make You Racist?